Recognizing the latest advancements in protective gloves and sleeves. For over 50 years, Kevlar® has collaborated with manufacturers to continuously improve the protection, durability, and comfort of protective gloves and sleeves. The DuPont™ Kevlar® Innovation Awards provides official licensees of the Kevlar® brand an opportunity to incorporate Kevlar® into their designs of protective gloves and sleeves in an effort to enhance worker protection. The DuPont™ Kevlar® Innovation Awards recognize excellence in protective glove and sleeve designs made with Kevlar®. The 2018 Award winners include some of the most innovative advancements against a range of workplace hazards. DuPont would like to congratulate the 2018 DuPont™ Kevlar® Innovation Award winners. The MCR Safety™ Cut Pro 93892NF glove was designed for environments such as steel fabrication applications, where workers require the highest levels of cut protection. Kevlar® was combined with Steel/Synthetic materials to achieve an ANSI cut level A9. 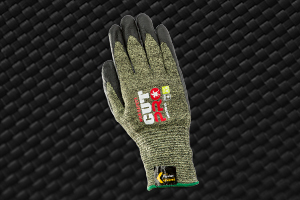 The MCR Safety™ Cut Pro 93892NF features a 13 gauge yellow/black DuPont™ Kevlar® Steel/Synthetic shell and features a strong black nitrile foam coating on the palm and fingers for enhanced grip, and abrasion resistance. 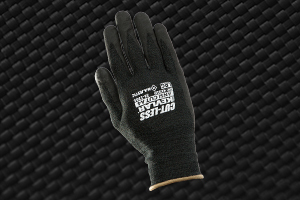 The Superior Glove S18KGDNE is the thinnest, most comfortable arc flash level 3 rated glove. Designed for use in the petrochemical, utilities and oil & gas industries, the Superior Glove S18KGDNE features an 18 gauge composite filament fiber protective shell. 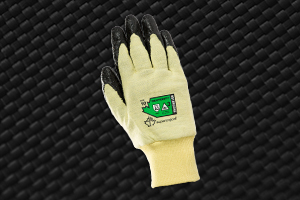 Additionally, the Superior Glove S18KGDNE is touchscreen compatible and provides a flame-resistant neoprene palm coating for better grip and protection, and features an electrostatic dissipating (ESD) carbon filament to impart anti-static properties. The Majestic Cut-Less With Kevlar® 31-1365 glove combines the cut-resistance properties of Kevlar® to achieve an ANSI cut level A4 with fantastic grip, wear resistance, and lightweight 18 gauge comfort. Designed for the automotive, manufacturing, construction, and fabrication industries, the Majestic Cut-Less with Kevlar® glove features a long knit cuff for a more secured fit and increased protection. In addition to providing remarkable protection from cuts and heat, the Majestic Cut-Less with Kevlar® glove features exceptional micro foam black nitrite palm coating for 360° breathability, increased dexterity, and improved grip in industrial applications. The pre-curved finger design helps minimize hand fatigue and is touchscreen compatible. 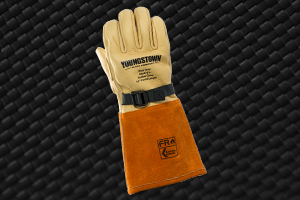 The Youngstown Glove Company 14” High Voltage Leather Protector with Kevlar® was designed for electrical utility workers and is ergonomically designed to fit over Class 1 through 4 rubber insulation gloves per ASTM F496/ASTM F696. All areas on the inside of the leather are lined with 100% Kevlar fiber. In this unique process of attaching Kevlar® to the leather, the 14” High Voltage Leather Protector allows the protective Kevlar® to work with the glove without the feeling of a bunching or loose liner. 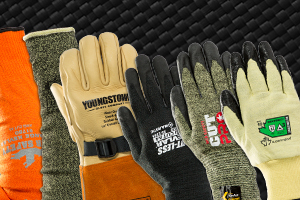 The Youngstown Glove Company 14” High Voltage Leather Protector with Kevlar® is Arc Rated to 48 cal/cm2, ANSI Cut Level A3, ANSI Puncture Level 5, and Flame Resistant to ASTM D6413. Additionally, the glove was finished with an FR Strap System so the protector won’t drip, melt, or ignite if exposed to an arc flash. The Protective Industrial Products 10-KVSYBH sleeve was designed for the automotive, metal stamping, and light heat applications. Comprised of DuPont™ Kevlar® Yellow/Black engineered yarn, the Protective Industrial Products 10-KVSYBH sleeve provides ANSI A6 cut protection. 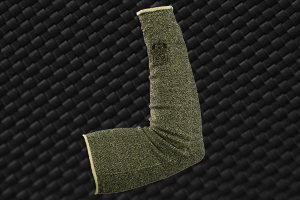 The Protective Industrial Products 10-KVSYBH sleeve provides a high-level cut and light heat protection that is comfortable and can be worn on bare arms or over clothing without sacrificing dexterity for the user. MCR Safety Orange Kevlar® Sleeves 91780T, 91780, 91740T, and 91740 were designed for use in the metal stamping, assembly and glass manufacturing industries. Comprised of highly visible DuPont™ Kevlar® Orange engineered yarns, MCR Safety Orange Kevlar® Sleeves provide ANSI A6 cut protection. MCR Safety Orange Kevlar® Sleeves also provide gussets for both expandability up the arm, which helps to keep the protective sleeve in place. 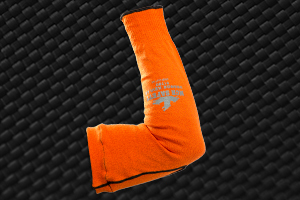 MCR Safety Orange Kevlar® Sleeves are available in 14 and 18 inches with and without a thumb slot. DuPont would like to thank everyone that continues to innovate with Kevlar® in an effort to make the workplace safer for everyone.